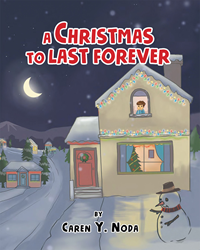 “A Christmas to Last Forever” from author Caren Y. Noda is a heartfelt story that reassures children that the joy and spirit of Christmas can continue throughout their lives. For parents with children beginning to question their beliefs about Christmas, it is an invaluable resource on how to transition these beliefs into traditions the family can enjoy. Caren Y. Noda, a former school teacher with two grown sons, resides in Hawaii with her husband. Her new book, “A Christmas to Last Forever” is a warm and loving story for all children who begin to question their beliefs about Christmas. The book helps families transition these beliefs into memorable traditions the whole family can enjoy. The story is about a boy who begins to question his beliefs about Santa, after a confrontation with another child. His mother's words of wisdom help him understand the true meaning of Christmas and shows him how to continue to have the excitement and joy forever. This book will help parents and children transition from childlike fantasy into reality, using traditions to keep alive the wonder and magic of this very special holiday. Published by New York City-based Page Publishing, Caren Y. Noda’s Christmas story reassures young readers that the joy and spirit of Christmas can continue throughout their lives. Readers who wish to experience this work can purchase “A Christmas to Last Forever” at bookstores everywhere, or online at the Apple iTunes store, Amazon, Google Play or Barnes and Noble.